Induction Integrated electronic engine management system. Indirect multipoint electronic injection. Throttle body diameter 57mm. Clutch Multiple disk in oil bath with patented PPC Claimed Horsepower: -assisted hydraulic control. Frame Type: Box section sloping twin-spar aluminium alloy frame Two-chamber adjustable Ohlins Racing steering damper with one-piece mounting. 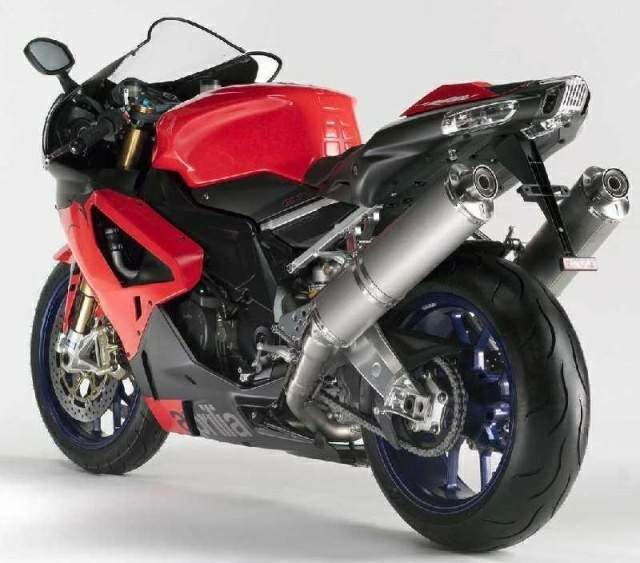 Since its introduction in 1998, the Mille has always been a good track bike, overshadowed perhaps by the success of Ducati in competitive racing but, to their credit has consistently remained one step ahead of the Bolognese firm in terms of outright sales over the last few years, making the Mille the best selling 1000cc sports twin in the UK. And with good reason too. While the Mille has never been one of my favourite road bikes, its ability on the racetrack never fails to impress. The first session out on the 'R' and I'm quickly reminded why I'm such a fan of Aprilia's big twin. On a circuit where confidence in the front end counts for so much, I honestly can't think of a single production bike in the same price bracket that would instil more confidence to push harder on. The years the Noale-based firm have spent winning 250cc World Championships clearly haven't gone to waste, and even on the stock settings the front tyre can be buried into the tarmac going into the turn with the kind of feedback that serves only to make you try harder and brake deeper into each of Losail's sixteen corners. Even the 'lower-spec' 'R' model gets Öhlins front forks as standard, which goes some way to explaining that sublime front end feel, while the rear end gets a Sachs monoshock in place of the Factory's Öhlins unit. The damping from the Sachs shock can feel a little uncontrolled under hard acceleration out of corners though, with a vague, floating feel from the rear as it bobs up and down on its stroke, never really feeling settled. Two clicks of rebound and compression damping and half a turn of preload and its pretty much sorted, so I wouldn't be too gutted if your budget won't stretch to the Öhlins-equipped Factory as the Sachs shock appears to be more than up to the job. Other than those initial rear end wobbles, stability under hard acceleration out of the turns is surprisingly good, especially considering the less expensive bike doesn't come with a steering damper. Replace the smooth Tarmac of Losail with the bumpy asphalt of Croft though, and I'm not so sure the same could be said. Luckily the bottom yoke is pre-tapped to take a damper, so retro fitting one really couldn't be simpler. Much of this stability and feedback is thanks in no small part to the slightly lazier steering angle, but some credit has to go to a riding position which spreads the weight evenly between feet, wrists and arse and seems to fit everyone. From five-foot-nothing Japanese tester, Toshi to six-foot-two former Gladiator (and soon to be ITV's BSB presenter), Janie Omorogbe, the post-test conversation didn't once mention any aches or pains caused by being too stretched or too cramped. For the next session, I'm out on the pricier Factory variant, and to be honest, I'm not so sure there's such a massive difference. Sure it handles and goes as well as the 'R', it's hardly likely not to, it just seems that Aprilia has almost shot itself in the foot by speccing up the 'R' to almost the same level. I say almost, because while they may have made the decision to opt for the top-of-the-ranger that little bit harder, they have just opened themselves up to a new market that might not have even considered a Mille before now. An exotic Italian bike loaded with trick components and graced with such delights as Öhlins forks and Brembo brakes for four-cylinder Jap money? The sixty-degree V-twin motor common to both bikes has received a few tweaks for '06. There may be only four more bee-aitch-pees on tap, but outright performance figures don't really tell the whole story. The delivery has been refined and a hole in the midrange has been filled with creamy smooth torque, keeping gear changes to a minimum. The same PPC (Pneumatic Power Clutch) system (slipper clutch to the rest of us) remains, and does work exceptionally well at keeping the rear end in line on corner entry, though if 'backing it in' is more important to you than a decent lap time, it'll slide in nice and smooth, with just a little provocation. Going back to the gearing for a second, Aprilia's technicians had quite thoughtfully changed the front sprocket from 16 down to 15 teeth to help gear the bike for the track, but on many of the corners I still find myself either bogging down on the way out in third, or simply unable to carry enough corner speed in second. The answer to this comes straight after lunch, when we're treated to testing the bikes with road legal end cans and the full Akrapovic Evo 6 race system. Now this is where Aprilia really have done something quite clever. 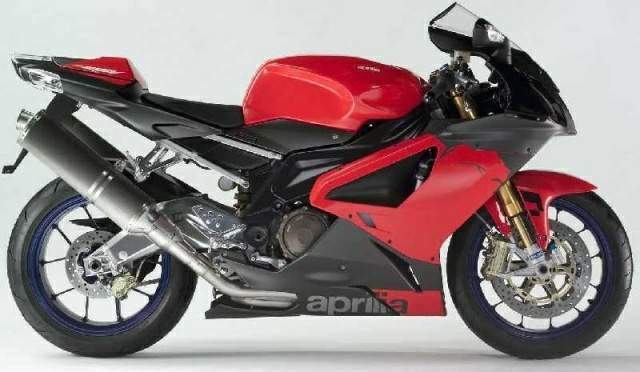 The Flash memory in the bike's CPU comes pre-programmed with two maps, so should you want to fit an Akrapovic system or end can, it's merely a case of getting your nearest Aprilia dealer to plug a machine in and switch the map over to suit, which should save a few quid on Power Commanders and dyno time. The first test of the afternoon was on the bikes equipped with just the road legal end cans and what a difference even that makes. Shot of the catalysers, the bike breathes more freely and where it felt a little flat off the turns, it now drives cleanly and picks up with far more enthusiasm. It now actually sounds like a twin too, but the piece de resistance is the bike equipped with the full race system. Loud enough to let everyone know it's a gutsy twin but not so loud as to be offensive, the direct comparison between suffocated, castrated standard machine and testosterone charged, fire-breathing race-piped machine is incredible. 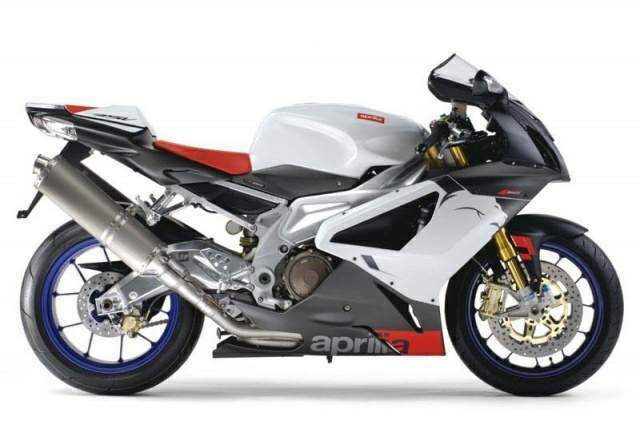 Best of all, fit the Aprilia approved Akrapovic system to your bike and it won't even affect your four year warranty. Did I say four year warranty? Yep, it's a brave move but Aprilia are so keen to get the ball rolling again with RSV sales that they'll be offering a full warranty to the same level as the Japs, but for twice as long. Blimey. Let's just hope that it's not two years warranty and two years waiting for the parts to turn up, though I'm assured (well I would be wouldn't I?) that that's not going to be an issue with Piaggio's backing. Overall, it has to be said that while the changes Aprilia has made to the RSV are relatively small, it is a better bike than before. Only slightly mind, so if you're looking at a two-year-old Factory with low mileage, then you shouldn't be too put off by the hype surrounding the new model. In fact, if anything this press test served as something of a reminder to us all. With the big four constantly battling it out and coming up with new models every two years, it's often all too easy to forget some of the great bikes that are already out there. And the RSV is one of them. The sixty-degree V-twin motor is now in its eighth year. The improvements made year-on-year have resulted in an engine that now pokes out a claimed 143bhp - interestingly the same as Ducati claim for their fourteen grand 999S. 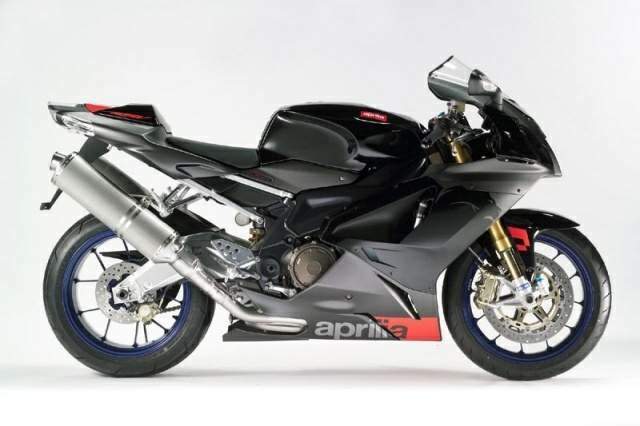 The changes Aprilia have made for 2006 include larger valves and a reworked cylinder head to improve gas flow, while the catalytic converters have been altered to meet strict Euro3 emissions regulations. The new catalysts have been fitted closer to the collector pipes to speed up the length of time it takes the converters to start working, while the secondary exhaust section has been lengthened by 200mm to boost torque at lower revs. The engine mapping has also been improved, with two maps built-into the CPU memory to allow swift changes between greenie-pleasing emissions limits and rider-pleasing performance. The air intake has also been enlarged to increase airbox pressure at high speeds. The most obvious change for 2006 is the standard fitment of Öhlins forks to the 'R' model. It also gets lightweight (but not forged) OZ wheels taking it ever-closer to the high-specification Factory. Both bikes share the same revised aluminium-silicone cast, 'Peraluman pressed' frame, which features a new, lighter steering stem with revised geometry that gives a 2 mm increase in trail (up from 100mm to 102mm) and a slight increase in rake which together add up to improved stability. The total weight of the frame is a fairly impressive 9.6kgs, with the swing arm weighing in at a shade under 5kgs. The Factory gets an Öhlins rear shock while the 'R' gets a Sachs unit. Both are fully adjustable including ride height. Radial Brembo calipers and discs grace the Öhlins forks and come complete with braided lines for improved feel. The bodywork has been completely redesigned to improve aerodynamics as well as styling. The main fairing is now just two separate parts, designed for easier removal for maintenance with larger air vents to improve engine cooling. The 'Starship Enterprise' tail unit has also been redesigned, and is now much sleeker, slightly higher and comes fitted with a 16 LED rear light and built in indicators. All in all the changes save a few grams and have improved aerodynamics, giving a CX (drag factor) of just 0.3.